In the spring of 2003 my sister went to New York for a visit. She had tickets for the opera and planned to do some sightseeing. When I heard she was going I asked her if she would go to the Metropolitan Museum and see the Studiolo from the Ducal Palace in Gubbio . She told me that the Metropolitan was on her list so I asked her to get me a copy of the book on the restoration of the studiolo. 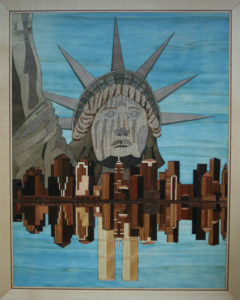 My sister said she would pay for it if I made her a marquetry picture of the New York sky line. I agreed, not realizing how long it would take me to finish the picture and take it to her. 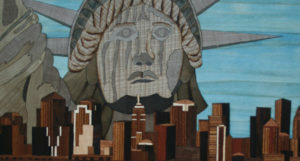 I was also looking for pictures of the Statue of Liberty. Most painting I have seen include the full statue. Also I noticed that since the statue has a copper finish, it often has a greenish look plus water marks running down her face. This made me think of the idea of simply putting her face in the background and drawing it with some of the water marks running down her face. I was hoping that she would then be seen as overlooking the New York skyline with tears in her eyes. 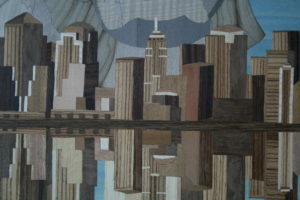 I had several pieces of blue dyed harewood which I decided to use for the sky and the water. 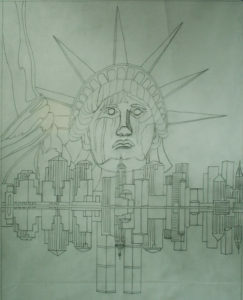 The first stage of making the picture involved cutting and piecing together the buildings. 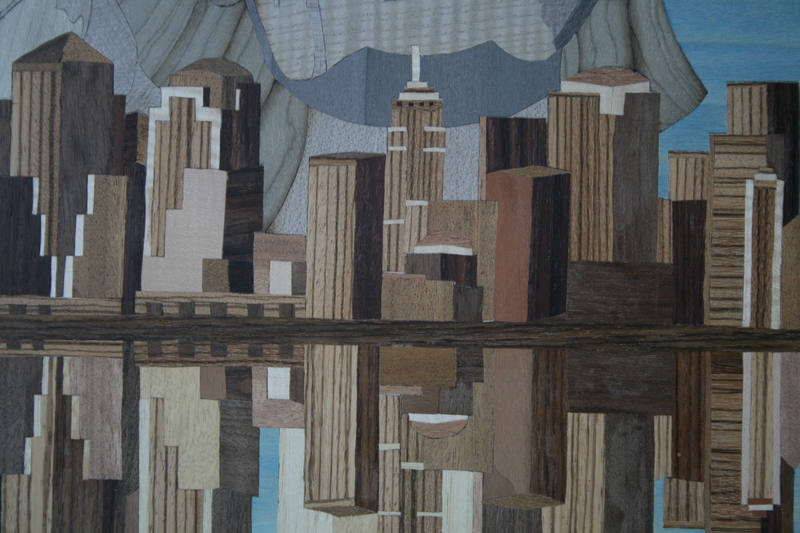 I used a waster piece of veneer to build the non-reflected (upper) buildings and a piece of the blue harwood for the reflected (lower) buildings. At a distance the windows in a high-rise building often look like vertical or horizontal lines. To create this effect I use Zebrano wood with the straightest lines I could find. I also tried to create a 3D effect with the different buildings using light and dark veneers together. There was enough variance in the architecture of the buildings that the picture did not look like a group of sticks stuck in the ground. The photograph I was using as a guide to the buildings on the sky line had the Empire State Building right in the middle of the picture and in between the two towers, so my picture has good symmetry. Therefore, I decided to make the refection of the buildings in the water (which was not in the photograph) perpendicular to the upper buildings on land. Figure 4 shows a section of the building with its reflection. Reflections in water are usually several shades lighter that the colors they are reflecting. 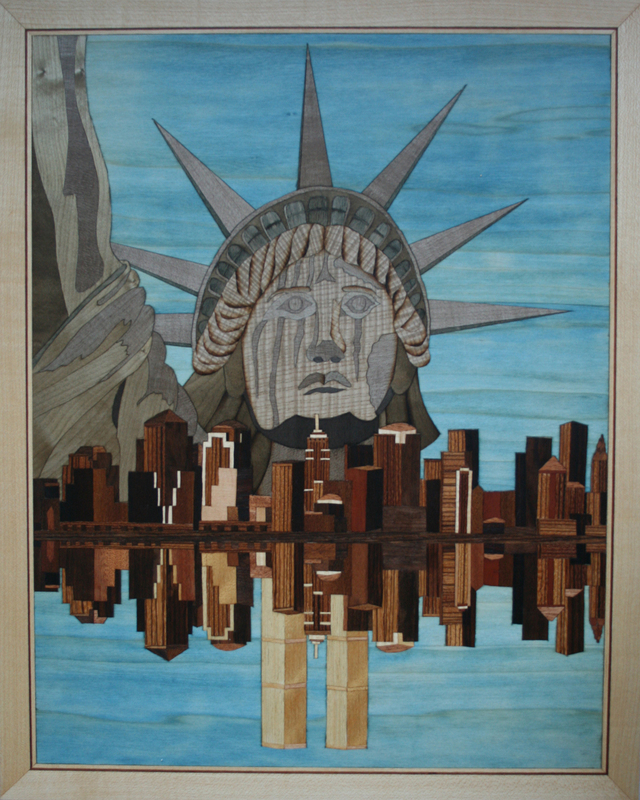 I attempted to emulate this by using slightly lighter shades of veneer in the lower section. In putting the face together, I used some sand shading in the appropriate places. The back of the neck required some sand shading in order to create a sense of three dimensions. I also shaded the layers of hair around the face. 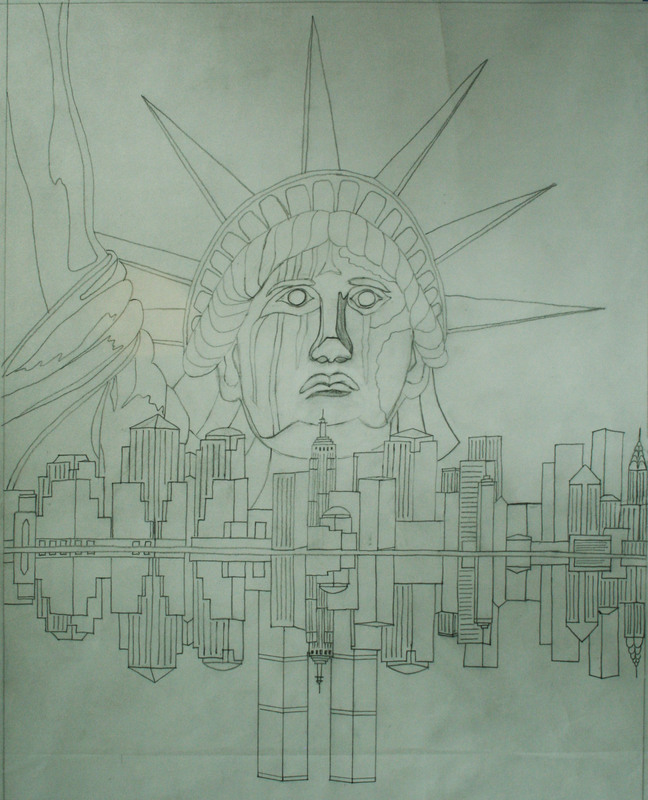 To complete the symmetry I want the vertical center of the face to line up with the Empire State Building and the refection of the Twin Towers of the World Trade Center. I finished the picture with a simple frame made from sycamore and a mahogany stringer. Since I was using the window method to construct the picture I had no paper to remove so I was able to apply the picture to the backing board of MDF. The backing board had its back and sides veneered before I applied the picture to the front side. I then sanded the picture and when I was satisfied with the finish I applied several coats of Danish Oil to bring out the colors in the veneers and then finished with several coats of clear mat polyurethane. It had only taken me about ten years to complete and present the picture to my sister in Toronto but I believe she thought it was worth the wait.